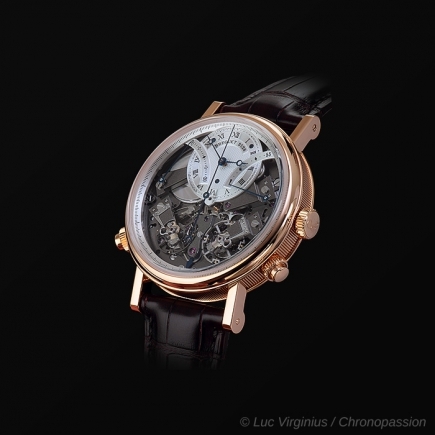 breguet | 27'900 € Tax inc. The story of Breguet and the open waters is one that goes back to the earliest days of the eponymous watchmaker’s illustrious career. Abraham-Louis Breguet was appointed chronometer maker of the French Royal Navy in 1815, a distinguished role for the French watchmaker. The Breguet Marine collection has long been a part of the brand’s lineup, paying homage to the days when marine chronometry was at the pinnacle of mechanical innovation, and to the brave spirits that explored the seven seas in unchartered territories. Adding contemporary, sporty nuances without sacrificing the classical Breguet design traits and uncompromising quality, the Marine collection was revamped in 2017 starting with an exceptional and complex piece, the Marine Équation Marchante. 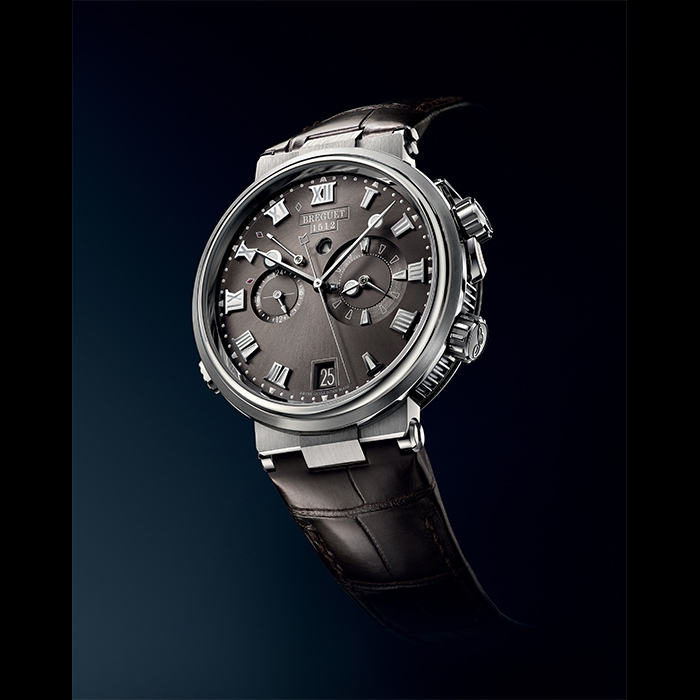 Then in 2018, Breguet introduced the entire new Marine collection, including the Marine Alarme Musicale 5547 in Titanium. Stunning visually as well as sonically, the Marine Alarme Musicale 5547 packs a handy host of functions – whether you’re traveling the world or staying locally. 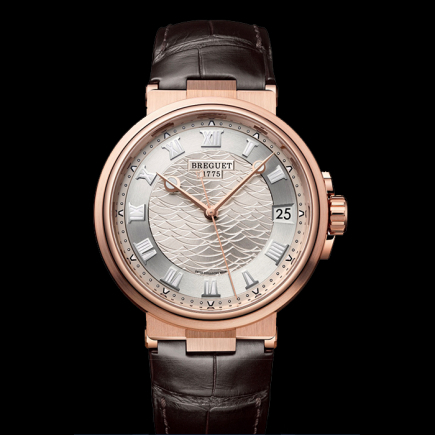 Equipped with an alarm function as well as a second time zone, the Breguet Marine Alarme Musicale 5547 is functional, uniquely styled and suitable for all situations. 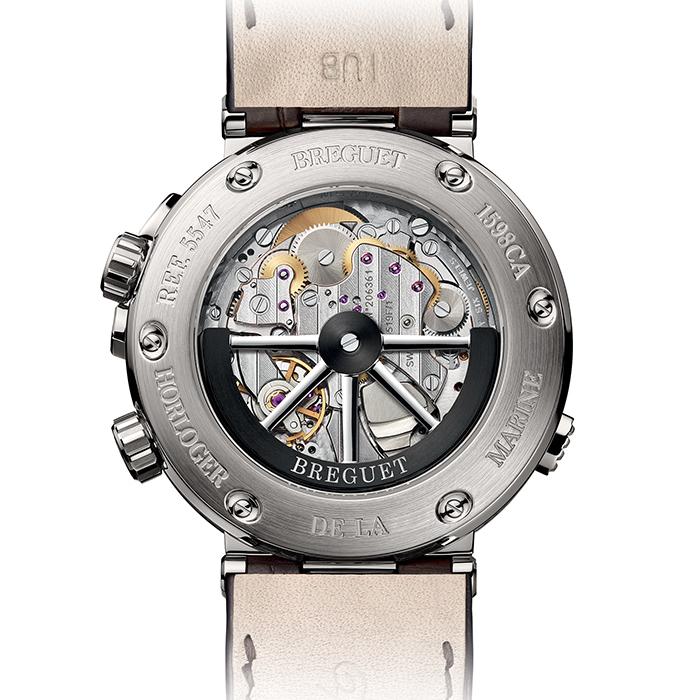 Measuring 40mm wide, the titanium case, decorated with Breguet’s signature fluted caseband. Lightweight, durable and hypoallergenic, Titanium is an ideal choice for an adventurous watch. The dial, made of solid gold, is finished in a sunburst slate grey tone. 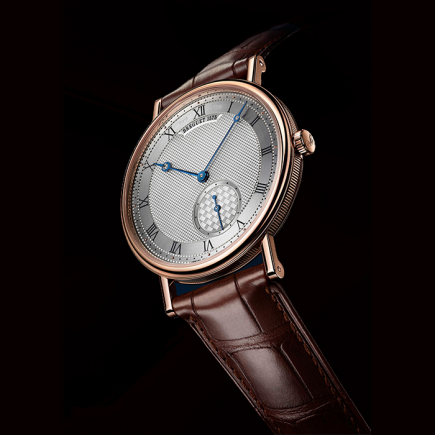 The traditional Breguet “apple” shape hands are revisited, with larger tips filled with SuperLuminova. 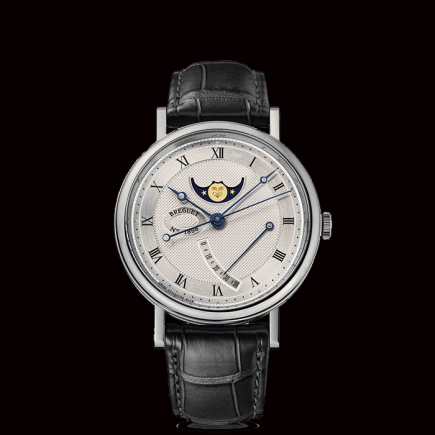 The applied Roman numerals are given the same treatment to enhance the legibility of the dial. Above the center of the dial is an aperture that shows whether the alarm function is on or off. To the right is the small hours and minutes dial for the second or local time zone. 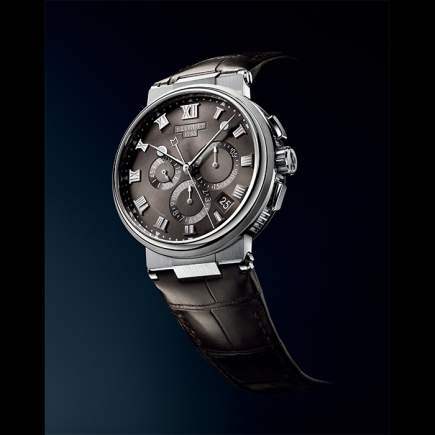 A power reserve indicator is discretely yet visibly placed between the small seconds and alarm status. 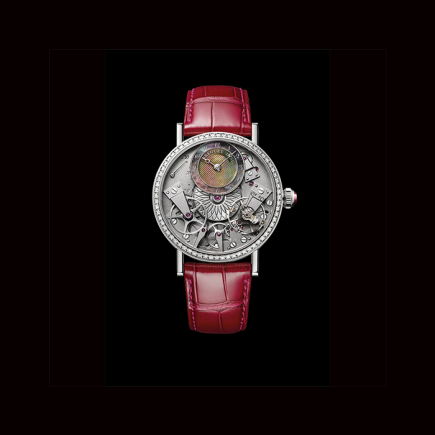 Visible through the sapphire crystal display back, the Marine Alarme Musicale 5547 is powered by the automatic in-house Calibre 519F/1 movement, which offers a minimum power reserve of 45 hours when fully wound. 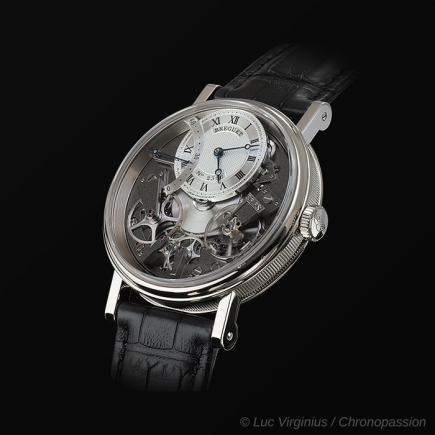 Innovative and robust, the movement is fitted with an inverted in-line lever escapement with silicon pallet lever, as well as a silicon balance hairspring. As a nod to its nautical inspiration, the rotor is made in the form of a ship’s wheel. 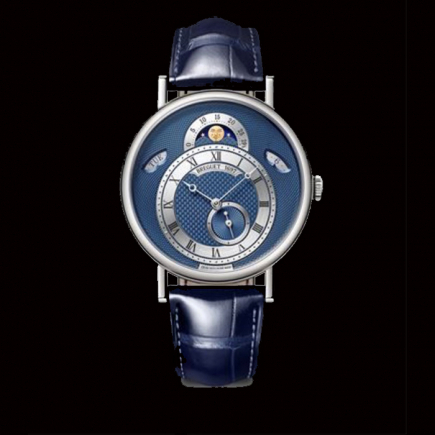 The Breguet Marine Alarme Musicale boasts a water resistance of 50 meters. Fixed to the uniquely shaped angular lugs, the Breguet Marine Alarme Musicale comes on a black textured rubber strap, which recalls the deck of a boat.